Using the language of advertising, Jaar conveys a political message about who “Americans” really are. Xu Bing’s text is illegible—even to those who can read Chinese. Basquiat appropriated wildly—and creatively—from Old Masters, Picasso, anatomical textbooks, and even jazz. Neshat’s series examines the complexities of women’s identities in the Middle East’s changing cultural landscape. In this canvas, Kiefer transformed architecture meant to honor Nazi heros into a memorial for their victims. 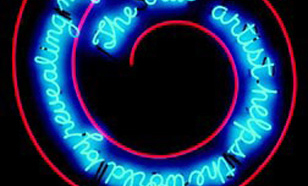 Using the medium of mass culture, Nauman brought high-brow questions about the role of art to broader society.